"The older I get, the better I was." That's my motto. We've now completed 4 months into the year, or about 1/3 of the year'. My goal, as stated earlier is about 7300 miles for the year. I had a hard month last month, and tipped 2500 miles YTD. Which is about 1/3 of the year. So, theoretically right on target. It is hard to estimate what will happen during the summer, so it is quite possible that I'll go over. My only annual goal is Crash Less Than Last Year. My motto: "Desperately trying to be a has-been than a never-was". I'm at 2,044 miles and the year is not even 1/2 done yet. I'm on track to smash any previous annual mileage records. I wish I'd kept records from the early 80's when I first got into doing century rides. But I'm pretty sure I wasn't riding as consistently as I am now. I certainly never rode in the winter months. goals: for the 1st time in many years I don't have one, other than "have a good time and find adventure". I used to ride 6-7K yr, race masters, etc.. This year - it's just not a priority. I've completely given up training & racing - no pressure anymore! It's actually rather nice. Instead of counting the miles, I spend a lot of time on 'Ride With GPS' plotting new routes in areas I haven't tried yet. This year I keep falling farther and farther behind. I just passed the 700 mile mark yesterday and have lowered my goal to 2000 miles for the year. Problems at work, and then lack of work have made this a very stressful year. Add to that some stress-related health problems and meds and the mileage just keeps dropping. Don't have a goal, but I'm at 2386 miles as of right now. And I don't ride in the winter here in New England. Didn't make it much into November last year. My advice, drop the mileage goal and just focus on the riding you're able to do. Sounds like you're turning the goals into something else to feel bad about, and you need the activity as something to enjoy. Good advice. I'll try to follow it. Thanks. Just finished the 6 month mark at 4008 miles out of goal of 7300 miles. So, just under 3300 left to go. On track to hit closer to 8000 miles. A little bit of a slow month for June, so we'll see. Hopefully more miles in July. 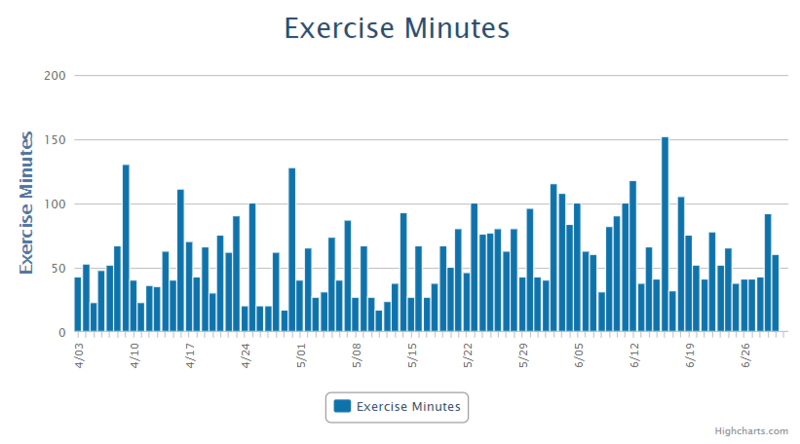 The first 6 months of the year is 4344 hours, so I've exercised for 6% of the time. 2600 is the goal (50 per week), 1297.35 miles as of today. January, February, and April were bad because it was cold and I'm really wimpy in that regard. Hitting the goal should be easy - I might up it to 3000. I don't have any particular mileage goals, but I do want to participate in a particular organized ride. I've tried in the past and I keep having silly issues that trip me up. Things are looking good for it this year so far. We'll see. My goal for this year was 7,000 miles. I have 2,659 miles so far. This is way under what I was expecting. Lumbar spinal stenosis forced me off my bike for three weeks in January until I was diagnosed and could walk up straight. Lost two more week in June due to an virus/infection that really knocked me out. Certainly not what I had planned for, but I'm happy I've been back on my bike the last two weeks. I also got my second epidural today, which hopefully will last until the end of the year. We've now finished 2/3 of the year. Where o where did the year go? My goal was 7300 miles for the year, or averaging 20 miles a day. The last couple of months were a bit shorter than I had hoped for, although I made some back up in August. Still plodding along. Now up to 5454 total miles, and a little less than 2000 miles left to reach the goal. Currently on pace to overshoot somewhat. Perhaps 8000 miles? Of course, I could just get tired of riding when it gets wet and miserable out. So far, we've got 4 months of the PYRR challenge done. And a 200K of the SR series. And I've run a 10K. And I'm up to 1141.8 km (709.5 miles). I think that's all so far. We did a 300K of the SR series in early March ... and that was that. But today is the first day of spring, so who knows where they next 4 months will lead. Last edited by Machka; 09-01-18 at 07:14 AM. I wish you the best of luck getting back on the road. I know it has been a difficult winter. My goal has morphed from not being concerned about getting faster to riding with "suplesse" and wanting to ride again after every ride. It's working nicely. My goal was 7,000 miles plus like the last two years, but that is not going to happen. 3,926 miles so far this year. I was off the bike more this year due to physical problems than the previous five years combined. In January I battled with lumbar spinal stenosis, which kept me off the bike for over three weeks. Hard to ride a bike when you can't stand up straight or walk for more than two minutes. In late May, I lost another three weeks due to a mysterious virus/flu. It took over a month for me to feel normal from that one. I'm glad to say that things are looking up since I last posted here in June. I have a new, more sedentary job with a less flexible schedule, but I've still managed to carve out time for riding. Medical issues are also mostly cleared up. 600 miles in July and August and I'm on track to at least hit my lowered goal of 2000 miles.